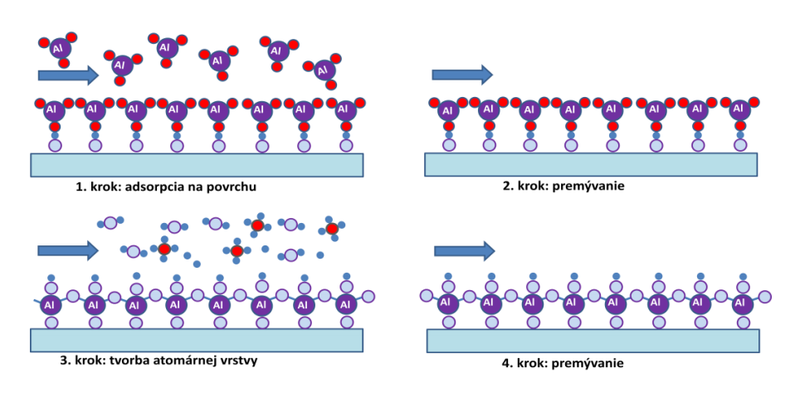 technologických krokoch, pri ktorých narastie sub-atomárna tenká vrstva oxidu. Obrázok: Jednotlivé kroky cyklu nanášania po atomárnych vrstvách pre rast Al2O3. Niu, G., Calka, P., Huang, P., Sharath, S.U., Petzold, S., Gloskovskii, A., Fröhlich, K., Zhao, Y., Kang, J., Schubert, M.A., Bärwolf, F., Ren, W., Ye, Z.-G., Perez, E., Wenger, C., Alff, L., and Schroeder, T.: Operando diagnostic detection of interfacial oxygen ‘breathing’ of resistive random access memory by bulk-sensitive hard X-ray photoelectron spectroscopy, Mater. Res. Lett. 7 (2019) 117-123. Fröhlich, K., Kundrata, I., Blaho, M., Precner, M., Ťapajna, M., Klimo, M., Šuch, O., and Škvarek, O.: Performance of HfOx– and TaOx-based resistive switching structures in circuits for min and max functions implementation, MRS Adv. 3 (2018) Iss. 59, 3427-3432. Mikolášek, M., Fröhlich, K., Hušeková, K., Racko, J., Rehacek, V., Chymo, F., Ťapajna, M., and Harmatha, L.: Silicon based MIS photoanode for water oxidation: a comparison of RuO2 and Ni Schottky contacts, Applied Surface Sci 461 (2018) 48-53. Fröhlich, K., Kundrata, I., Blaho, M., Precner, M., Ťapajna, M., Klimo, M., Šuch, O., and Škvarek, O.: Hafnium oxide and tantalum oxide based resistive switching structures for realization of minimum and maximum functions, J. Applied Phys. 124 (2018) 152109. Stoklas, R., Gregušová, D., Hasenöhrl, S., Brytavskyi, I.V., Ťapajna, M., Fröhlich, , Haščík, Š., Gregor, M., and Kuzmík, J.: Characterization of interface states in AlGaN/GaN metal-oxide-semiconductor heterostructure field-effect transistors with HfO2 gate dielectric grown by atomic layer deposition, Applied Surface Sci 461 (2018) 255-259.